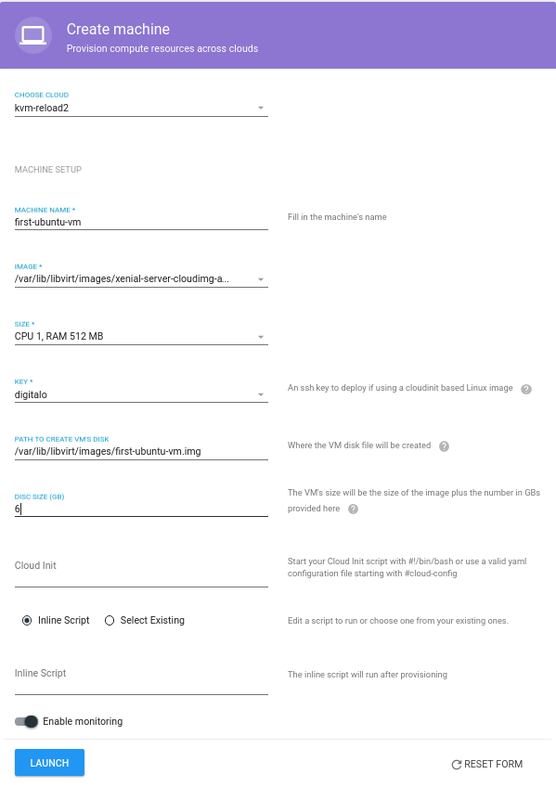 2) Deploying new VMs using disk images, iso images, or using the preferred way of cloudinit based images. Let's begin by launching an Ubuntu 14.04 server. This example uses a bare metal server on packet.net, which offers the ability to launch bare metal servers through their API. We bought a server with 4 cores and 32GB RAM. Packet.net also gives us the choice to purchase a public net with 4 ip addresses, we'll buy one and make sure they are assigned to the KVM server in order to be used by the VMs. If you already have a KVM hypervisor up and running, skip on the "How to create VMs", section below. Deploying a new VM on packet.net through the mist.io wizard. 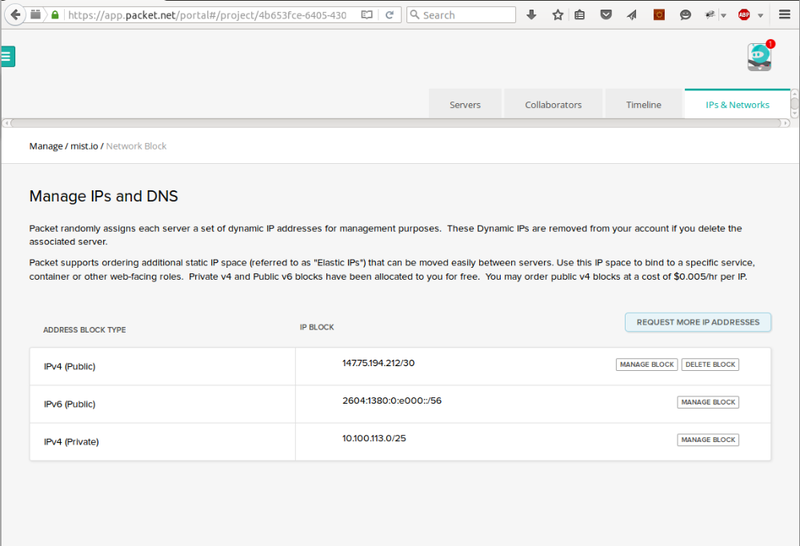 Packet.net's network dashboard for assigning an ipv4 block. The following command will install KVM on Ubuntu 14. There's a good guide on https://help.ubuntu.com/community/KVM/Installation on how to install KVM on Ubuntu. The package genisoimage is required for the cloudinit based images that we'll use. We will also need uml-utilities plus we'll install some utilities like wget and vim. After installing KVM, if we runrun virsh list, we should see no VMs running, as expected. If you're not familiar with cloudinit you can have a look at https://cloudinit.readthedocs.org/en/latest/. It is the defacto way of handling the initialization of a Linux server (on KVM, OpenStack and other cloud environments). The cloud images are ready to use and are usually not very big (eg Debian 8.2.0 amd qcow2 image is 500MB. 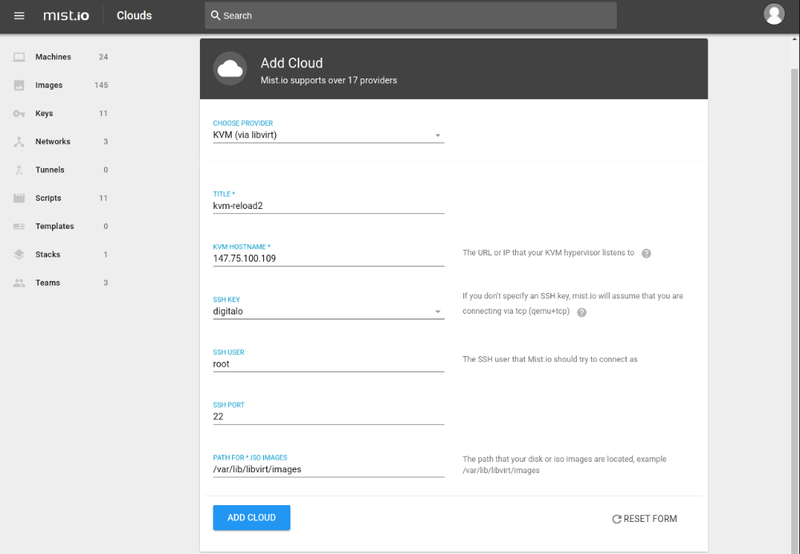 You can also specify and use one of your images, but we suggest starting with a cloudinit based image. Cloudinit based images -compared to local images (netiso or normal ISOs)- are ready to use, so no extra installation or configuration is required. The VM will be created and the SSH key will automatically be deployed (plus the cloudinit script will cofigure the VM, if it is specified). If KVM can assign public IPs to newly created VMs, Mist.io will be able to connect to it through SSH and the web terminal will be enabled. If it only assigns private IPs, then Mist.i won't be able to connect, however you can connect through the KVM server (arp -an will show it's private ip address so you can SSH with the key you have deployed). If you're using the Saas version of mist.io - https://mist.io - you can use the VPN functionality to connect to private ips. 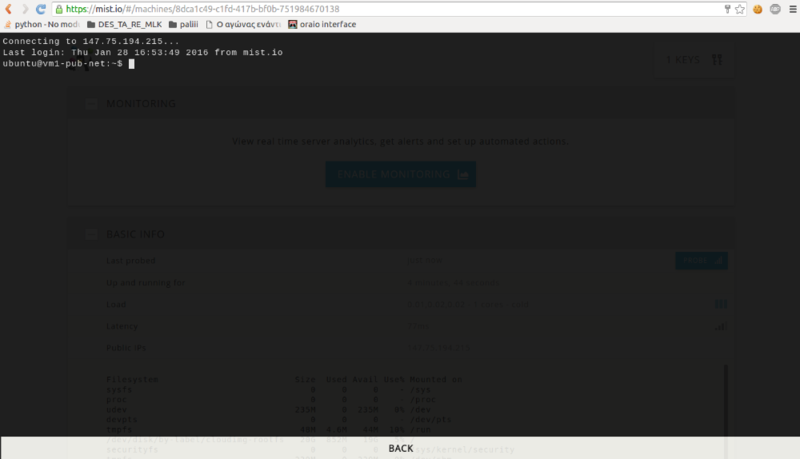 3) Launch a new VM through Mist.io. This will take the default network settings of KVM, which is a private ip (192.168.122.1-254 range), as we haven't configured anything network related. On the Machines section, click on Create to launch the wizard and select the disk from the images drop down list, set name/size and choose an SSH key. This key will be deployed on the server. Optionally you can paste a cloudinit script (to install specific users, packages etc) but this is not mandatory. Since the IP is private, Mist.io won't be able to connect, however you can connect through the KVM server. 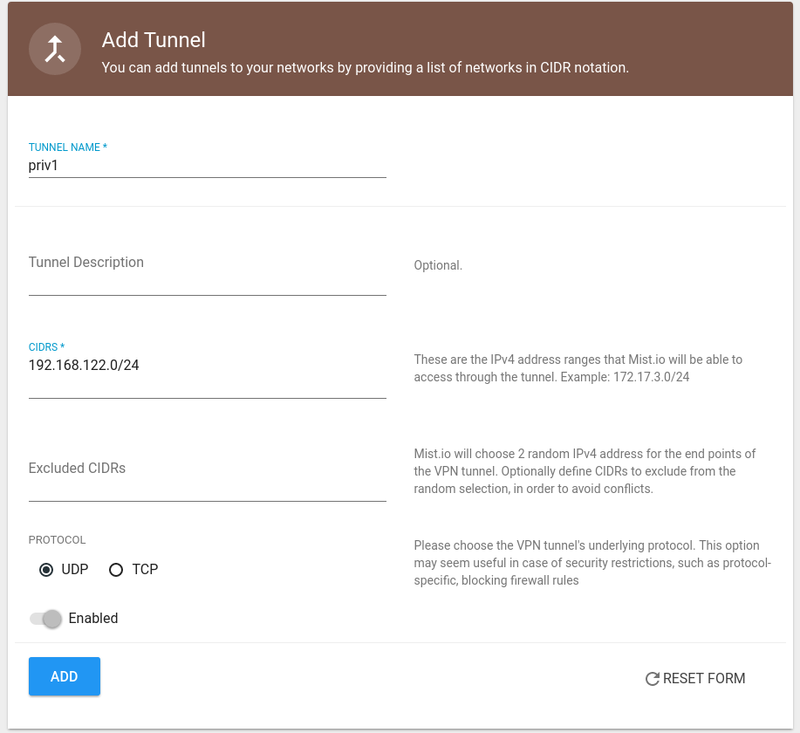 Run the command arp -an to see the IP address of the created VM, so you can ssh with the key you have deployed to confirm that the VM has been created as requested. The MAC address of the created VM is included on file /etc/libvirt/qemu/VM_name.xml which is the configuration file for VM_name. PING mist.io (54.67.73.187) 56(84) bytes of data. The official Ubuntu cloudinit image creates the user ubuntu and sets passwordless sudo. 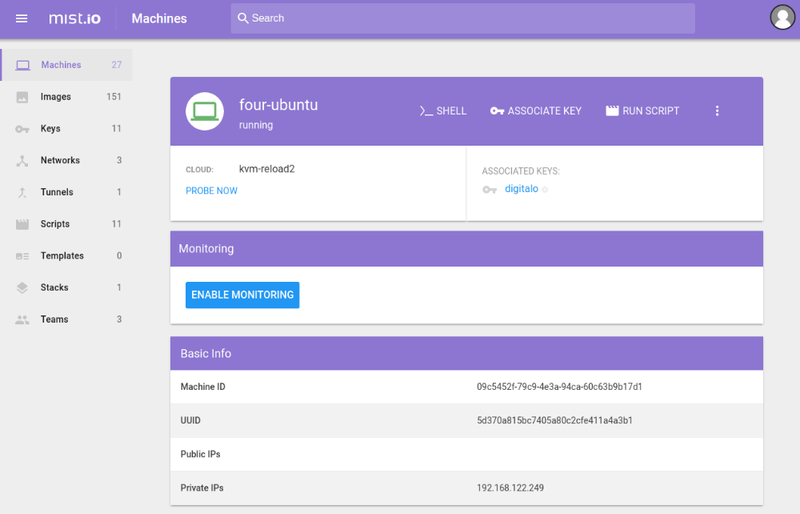 We just made sure we can connect with the SSH key specified, the VM has gotten a private ip and has access to the net. Also the cloudinit script has run, and file /OK has been created. Note that the uuid has to be the same as the one that was auto-generated for us by KVM, otherwise if we provide another one, or omit it, we will get prompted that the operation has failed. We'll specify the KVM default network to supply a dhcp pool of 147.75.194.213 to 147.75.194.215. The VMs will use 147.75.194.212 as their gateway ip which is the bridge interface of the KVM server, forwarding traffic to the eth0 interface. We'll place the settings on /etc/rc.local to take effect once the system is rebooted. Now let's create a VM. Using the wizard, we specify name, the cloudinit image, size, specs, ssh key and optionally a cloudinit script. After just 1-2 minutes the VM is created, gets one of the available public IPs and Mist.io can connect to it, thus it appears on the listing with the uptime icon. We can also use the web shell. You can run the following actions on VMs: shutdown, reboot, destroy, undefine (destroy and remove XML configuration file), suspend, resume and start. 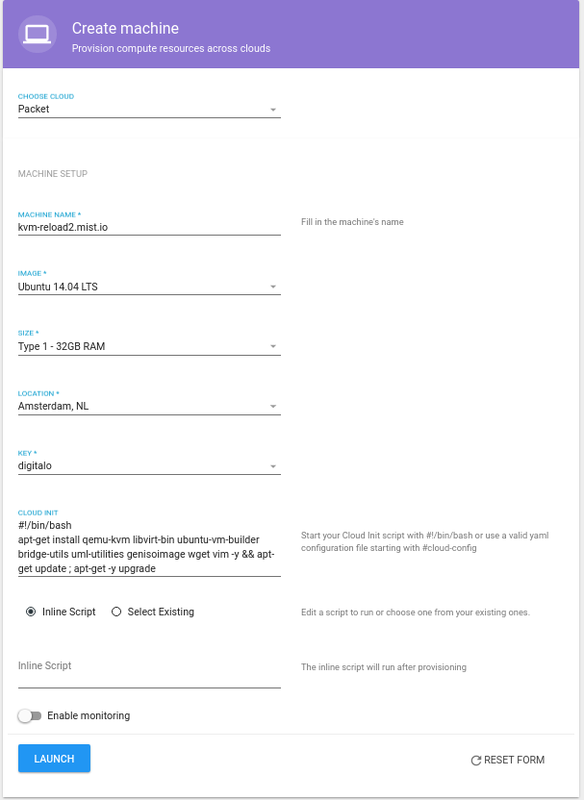 There is a quick way to view the VM configuration through the full metadata list on the VM page.